I have been experimenting using my favourite groundcover as a lawn. Cotula squalida, a creeping evergreen from New Zealand is one of the best performers I have come across. 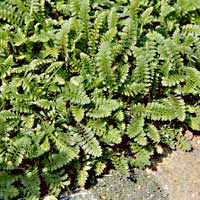 It makes a great alternative lawn because it reaches only 2.5cm high and is happy in a semi-shady spot. There is no need to avoid some of the classic alternative lawns - camomile 'Trenague' is wonderful on the right soil, and interweaving thymes is a design classic for a reason. 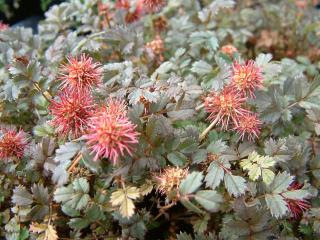 In the sunnier parts of my garden the fast-spreading Acaena microphylla is romping away. Acaena 'Copper Carpet' is a great choice and has made a lovely evergreen carpet in my mothers front garden (very clay soil, which only gets sun for half the day) Despite the lovely ornamental burrs which give this plant its charm, it is soft underfoot, and slightly springy. The slightly glaucus colouring of the finely cut leaves, makes this an elegant choice that tones in well with red brick, slate and grey stone. If you are growing an usual lawn in your garden, I would love to hear about it and see some piccies! I tried a variegated thyme once but it didn't work. Is there a tough one you would recommend for really poor, dense soil in warm shade - which doesn't mind being walked upon? Sorry - 'Collected' was me with the wrong mail box open. What is the drainage like? You may need to improve the drainage as all thyme like it sharp - although it sounds like you may not have enough sunlight for any thyme to be that happy. If they are too obvious, bug me again and I'll get my thinking cap back on! 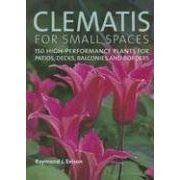 "As a uk garden designer and writer, I created the Green Garden Design blog to catalogue clever and beautiful finds and to inform and inspire others about sustainable landscape architecture and garden design..."
I am loving 'Clematis for Small Spaces' at the moment. Great tips for patios, decks, balconies and borders.